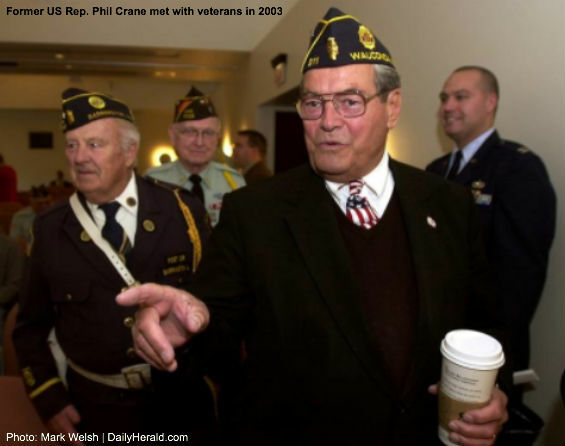 Former Congressman and longtime conservative leader Phil Crane passed away on Saturday. Phil Crane had a long association with CHQ Chairman Richard A. Viguerie. In the 1960s and 70s Phil Crane, along with Bob Dornan, Dr. Ron Paul, John Ashbrook, senators Jesse Helms and Strom Thurmond were among the leaders of the conservative movement who challenged not only the Democrats, but the Republican establishment as well. Along with Dornan, Paul, Ashbrook, Helms and Thurmond, Phil Crane was one of the early stars of the conservative movement who sought elective office that Mr. Viguerie helped market. .
As Mr. Viguerie recounts in his latest book TAKEOVER, he handled the mail for Phil Crane’s special election to Congress in 1969 for the seat Donald Rumsfeld vacated to join President Nixon’s cabinet. Crane won the special election and represented the largely rural district in Illinois for some 35 years. He quickly became one of the then-young tigers of the conservative movement that helped propel Ronald Reagan into the White House and, over the past 50 years, has changed American politics by slowly pushing the Republican Party to become the political home of limited government conservatives. It has long been forgotten by most outside the conservative movement, but in the lead-up to the 1980 election many conservatives, especially those who then qualified as 'young' back in 1979, saw Phil Crane as a viable alternative to Ronald Reagan, who would be almost 70-years old on Inauguration Day. But Phil Crane was a much more important and consequential figure in the conservative movement than his longshot presidential campaign indicated. Perhaps Phil Crane’s greatest contribution to the modern conservative movement was his commitment to build the movement, not his 1980 campaign or his legislative record. Although his legislative record was one of principled conservatism – over his long career, he got a 99 percent rating from the American Conservative Union – and he authored the 1974 legislation permitting the private ownership of gold, these things are again, somewhat forgotten, but the Republican Study Committee he founded lives on to affect legislation and what happens on Capitol Hill every day. Adam Clymer reminded us in his obituary of Crane for The New York Times that, “Mr. Crane persuaded House colleagues of the importance of establishing conservative institutions comparable to those liberals used. The first was the Republican Study Committee, which he founded in 1973 with fewer than a dozen members. But it grew to dominate House G.O.P. ranks. By 2011 it had more than 175 members, about three-fourths of all House Republicans. But his most innovative step was to put on the first political infomercial, a half-hour program shown 209 times around the country. Mr. Crane presided, calling the canal “the American Canal at the Isthmus of Panama,” which he insisted was “vital to our economy, our national defense and our spirit.” He introduced other speakers and urged viewers to write their senators and send money to the American Conservative Union. The organization turned a profit and sharply increased its membership after the broadcasts. Even though he dropped out of the 1980 presidential primaries early, Phil Crane was the favorite for Vice President of many conservative delegates to the 1980 Republican National Convention in Detroit. However his chances were thoroughly snuffed when the Republican establishment first floated the idea of a Jerry Ford co-presidency and Reagan was convinced that to win he needed to buy off the establishment by choosing George H.W. Bush as his Vice President. Rest in Peace Phil Crane – what a different world it might be had you, instead of George H.W. Bush, been chosen as Ronald Reagan's Vice President. Submitted by sir_aslan on Tue, 11/11/2014 - 18:59. Submitted by sir_aslan on Tue, 11/11/2014 - 18:20. I remember when Reagan met with Kissinger and Ford in what was referred to as a "Smoke filled" back room. Reagan even offered Ford the position of Vice President but Gerald Ford wanted to be Co-Equal with Reagan. Reagan would have none of it but felt compelled to select "Voodoo Economics" George Herbert Walker Bush. I believe once Bush was onboard...the establishment Globalists and their Neocon buddies slowly co-opted the Reagan Presidency. Unfortunately, Reagan and the Conservatives were never held accountable for their landslide election. After the voting, most Americans thought it was a win for the people and for the Constitution but no it was just the opposite. Unchecked and Unverified...the damage was enormous. We must not make the same mistake again.